Émile Durkheim (April 15, 1858 – November 15, 1917) was a French sociologist whose contributions were instrumental in the formation of sociology, anthropology and religious studies. His work and editorship of the first journal of sociology (L'Année Sociologique) helped establish sociology within the academy as an accepted social science. 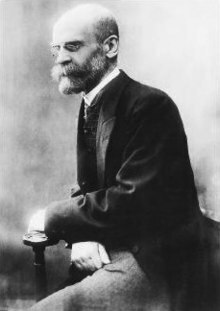 Durkheim lectured and published sociological studies on subjects such as education, crime, religion, suicide and other aspects of society. He is often referred to as "The Father of Sociology". There is no sociology worthy of the name which does not possess a historical character. Émile Durkheim, Debate on Explanation in History and Sociology (1908). Kant postulates God, since without this hypothesis morality is unintelligible. We postulate a society specifically distinct from individuals, since otherwise morality has no object and duty no roots. Sociology and philosophy (1911), D. Pocock, trans. (1974), p. 51. When mores are sufficient, laws are unnecessary. When mores are insufficient, laws are unenforceable. Émile Durkheim (1893), De La Division Du Travail Social, 1933. Translation of by G. Simpson. 1947 edition translated by George Simpson. This work had its origins in the question of the relations of the individual to social solidarity. Why does the individual, while becoming more autonomous, depend more upon society? How can he be at once more individual and more solidary? Certainly, these two movements, contradictory as they appear, develop in parallel fashion. This is the problem we are raising. It appeared to us that what resolves this apparent antinomy is a transformation of social solidarity due to the steadily growing development of the division of labor. The division of labour is not of recent origin, but it was only at the end of the eighteenth century that social cognizance was taken of the principle. though, until then, unwitting submission had been rendered to it. To be sure, several thinkers from earliest times saw its importance; but Adam Smith was the first to attempt a theory of it. Moreover, he adopted this phrase that social science later lent to biology. But the division of labor is not peculiar to the economic world; we can observe its growing influence in the most varied fields of society. The political, administrative, and judicial functions are growing more and more specialized. It is the same with the aesthetic and scientific functions. It is long since philosophy reigned as the science unique; it has been broken into a multitude of special disciplines each of which has its object, method, and thought. “Men working in the sciences have become increasingly more specialized. At this point, an urgent question arises:... Is it our duty to seek to become a thorough and complete human being, one quite sufficient unto himself; or, on the contrary, to be only a part of a whole, the organ of an organism? Briefly, is the division of labor, at the same time that it is a law of nature, also a moral rule of human conduct; and, if it has this latter character, why and in what degree? Opinion is steadily inclining towards making the division of labor an imperative rule of conduct, to present it as a duty. Those who shun it are not punished precise penalty fixed by law, it is true; but they are blamed. The time has passed when the perfect man was he who appeared interested in everything without attaching himself exclusively to anything, capable of tasting and understanding everything finding means to unite and condense in himself all that was most exquisite in civilization. … We want activity, instead of spreading itself over a large area, to concentrate and gain in intensity what it loses in extent. We distrust those excessively mobile talents that lend themselves equally to all uses, refusing to choose a special role and keep to it. We disapprove of those men whose unique care is to organize and develop all their faculties, but without making any definite use of them, and without sacrificing any of them, as if each man were sufficient unto himself, and constituted an independent world. It seems to us that this state of detachment and indetermination has something anti-social about it. The praiseworthy man of former times is only a dilettante to us, and we refuse to give dilettantism any moral value; we rather see perfection in the man seeking, not to be complete, but to produce; who has a restricted task, and devotes himself to it; who does his duty, accomplishes his work. “To perfect oneself,” said Secrétan, “is to learn one's role, to become capable of fulfilling one's function. . . The measure of our perfection is no longer found in our complacence with ourselves, in the applause of a crowd, or in the approving smile of an affected dilettantism, but in the sum of given services and in our capacity to give more.” [Le principe de la morale, p. 189] … We no longer think that the exclusive duty of man is to realize in himself the qualities of man in general; but we believe he must have those pertaining to his function. … The categorical imperative of the moral conscience is assuming the following form: Make yourself usefully fulfill a determinate function. Everybody knows that we like those who resemble us, those who think and feel as we do. But the opposite is no less true. It very often happens that we feel kindly towards those who do not resemble us, precisely because of this lack of resemblance. Solidarity can grow only in inverse ratio to personality. Solidarity which comes from likenesses is at its maximum when the collective conscience completely envelops our whole conscience and coincides in all points with it. At the moment when this solidarity exercises its force, our personality vanishes, as our definition permits us to say, for we are no longer ourselves, but the collective life. In the name of the dogma of struggle for existence and natural selection, they paint for us in the saddest colors this primitive humanity whose hunger and thirst, always badly satisfied, were their only passions; those sombre times when men had no other care and no other occupation than to quarrel with one another over their miserable nourishment. To react against those retrospective reveries of the philosophy of the eighteenth century and also against certain religious doctrines, to show with some force that the paradise lost is not behind us and that there is in our past nothing to regret, they believe we ought to make it dreary and belittle it systematically. Nothing is less scientific than this prejudice in the opposite direction. If the hypotheses of Darwin have a moral use, it is with more reserve and measure than in other sciences. They overlook the essential element of moral life, that is, the moderating influence that society exercises over its members, which tempers and neutralizes the brutal action of the struggle for existence and selection. Wherever there are societies, there is altruism, because there is solidarity. Every society is a moral society. In certain respects, this character is even more pronounced in organised societies. Because the individual is not sufficient unto himself, it is from society that he receives everything necessary to him, as it is for society that he works. Methodological rules are for science what rules of law and custom are for conduct. If I do not submit to the conventions of society, if in my dress I do not conform to the customs observed in my country and in my class, the ridicule I provoke, the social isolation in which I am kept, produce, although in an attenuated form, the same effects as punishment in the strict sense of the word. As an industrialist, I am free to apply the technical methods of former centuries; but by doing so, I should invite certain ruin. When, then, the sociologist undertakes the investigation of some order of social facts, he must endeavour to consider them from an aspect that is independent of their individual manifestations. A social fact is normal, in relation to a given social type at a given phase of its development, when it is present in the average society of that species at the corresponding phase of its evolution. One can verify the results of the preceding method by showing that the generality of the phenomenon is bound up with the general conditions of collective life of the social type considered. This verification is necessary when the fact in question occurs in a social species which has not yet reached the full course of its evolution. Imagine a society of saints, a perfect cloister of exemplary individuals. Crimes, properly so called, will there be unknown; but faults which appear venial to the layman will create there the same scandal that the ordinary offense does in ordinary consciousnesses. If, then, this society has the power to judge and punish, it will define these acts as criminal and will treat them as such. With reference to practical social doctrines, our method permits and commands the same independence. Sociology thus understood will be neither individualistic, communistic, nor socialistic in the sense commonly given these words. On principle, it will ignore these theories, in which it could not recognize any scientific value, since they tend not to describe or interpret, but to reform, social organization. In short, all suicides of the insane are either devoid of any motive or determined by purely imaginary motives. Now, many voluntary deaths fall into neither category; the majority have motives, and motives not unfounded in reality. Not every suicide can therefore be considered insane, without doing violence to language. To pursue a goal which is by definition unattainable is too condemn oneself to a state of perpetual unhappiness. It is society which, fashioning us in its image, fills us with religious, political, and moral beliefs that control our actions. It is not human nature which can assign the variable limits necessary to our needs. They are thus unlimited so far as they depend on the individual alone. Irrespective of any external regulatory force, our capacity for feeling is in itself an insatiable and bottomless abyss. Man's characteristic privilege is that the bond he accepts is not physical but moral; that is, social. He is governed not by a material environment brutally imposed on him, but by a conscience superior to his own, the superiority of which he feels. Because the greater, better part of his existence transcends the body, he escapes the body's yoke, but is subject to that of society. A passion for the infinite is daily presented as a sign of moral distinction, when in fact it can only occur in disturbed minds which accord the status of a norm to the very disturbance from which they are suffering. Émile Durkheim, The Elementary Forms of the Religious Life: A Study in Religious Sociology (1912). At the roots of all our judgments there are a certain number of essential ideas which dominate all our intellectual life; they are what philosophers since Aristotle have called the categories of the understanding: ideas of time, space, class, number, cause, substance, personality, etc. They correspond to the most universal properties of things. They are like the solid frame which encloses all thought: this does not seem to be able to liberate itself from them without destroying itself. The general conclusion of the book which the reader has before him is that religion is something eminently social. Space is not the vague and undetermined medium which Kant imagined; if purely and absolutely homogeneous, it would be of no use, and could not be grasped by the mind. Spatial representation consists essentially in a primary coordination of the data of sensuous experience. But this coordination would be impossible if the parts of space were qualitatively equivalent, if they were really interchangeable. Now, it is unquestionable that language, and consequently the system of concepts which it translates, is the product of a collective elaboration. What it expresses is the manner in which society as a whole represents the facts of experience. The ideas which correspond to the diverse elements of language are thus collective representations. Even their contents bear witness to the same fact. In fact, there are scarcely any words among those which we usually employ whose meaning does not pass, to a greater or less extent, the limits of our personal experience. Very frequently a term expresses things which we have never perceived or experiences which we have never had or of which we have never been the witness. Even when we know some of the objects which it concerns, it is only as particular examples that serve to illustrate the idea which they would never have been able to form by themselves. Thus there is a great deal of knowledge condensed in the word which I never collected, and which is not individual; it even surpasses me to such an extent that I cannot even completely appropriate all its results. Which of us knows all the words of the language he speaks and the entire signification of each? The category of class was at first indistinct from the concept of the human group; it is the rhythm of social life which is at the basis of the category of time; the territory occupied by the society furnished the material for the category of space; it is the collective force which was the prototype of the concept of efficient force, an essential element in the category of causality. Émile Durkheim … strove to insert and settle “society” in the place vacated by God and by Nature viewed as God’s creation or embodiment—and thereby to claim for the nascent nation-state that right to articulate, pronounce and enforce moral commandments and command the supreme loyalties of its subjects; the right previously reserved for the Lord of the Universe. Zygmunt Bauman, The Art of Life (Cambridge: 2008), pp. 31-33. One of the most penetrating diagnoses of the capitalist culture in the nineteenth century was made by sociologist, E. Durkheim, who was neither a political nor a religious radical. He states that in modern industrial society the individual and the group have ceased to function satisfactorily; that they live in a condition of "anomie," that is, a lack of meaningful and structuralized social life; that the individual follows more and more "a restless movement, a planless self-development, an aim of living which has no criterion of value and in which happiness lies always in the future, and never in the present achievement." Durkheim points out that only the political state survived the French Revolution as a solitary factor of collectivization. As a result, a genuine social order has disappeared, the state emerging as the only collective organizing activity of the social character. The individual, free from all genuine social bonds, finds himself abandoned, isolated, and demoralized. Society becomes "a disorganized dust of individuals." According to Durkheim’s standpoint. the criteria underlying Marx’s hopes for the elimination of technological alienation represent a reversion to moral principles which are no longer appropriate to the modern form of society. This is exactly the problem which Durkheim poses at the opening of The Division of Labour: ‘Is it our duty to seek to become a thorough and complete human being. one quite sufficient unto himself; or, on the contrary, to be only a part of a whole, the organ of an organism?’ The analysis contained in the work, in Durkheim’s view, demonstrates conclusively that organic solidarity is the ‘normal’ type in modern societies, and consequently that the era of the ‘universal man’ is finished. The latter ideal, which predominated up to the seventeenth and eighteenth centuries in western Europe is incompatible with the diversity of the contemporary order. In preserving this ideal, by contrast, Marx argues the obverse: that the tendencies which are leading to the destruction of capitalism are themselves capable of effecting a recovery of the ‘universal’ properties of man. which are shared by every individual. This page was last edited on 9 October 2018, at 22:54.